The 2 most popular types of emulsions on the market today seem to be dual cure and photopolymer. Each of the 2 different emulsions have very different characteristics. These unique properties makes it possible to use either emulsion to adapt to your own printing situation. The type of art , film and even the screens you use may be partnered up with the right emulsion to give you better results and an easier time printing. Rather than try to explain all the different situations you might use either emulsion, I will describe the different characteristics that I think will affect you most at home. There are three points I will make about each of the 2 emulsions. Hopefully you will be able to digest this information and apply it to your own printing needs. You should be able to do this easily. One of the first things to note about dual cure emulsions and photopolymers is that the shelf life is very different. A dual cure comes with the sensitizer separate and has to be mixed into the emulsion base. As soon as this is done, the clock starts ticking and most dual cure emulsions will have a standard shelf life of about 1 month. This is giving that the ambient humidity and room temperature are not extreme in variances. Temperature and heat exposure will affect all emulsions and their shelf life. That being said, photopolymer emulsions may have a shelf life of up to 1 year and they do not need to be mixed. Shelf life may be the single most important factor in purchasing an emulsion. If you can’t use the emulsion before it spoils, then it may be a good idea to go with longer shelf life. The second major concern is the exposure latitude of the emulsion. This refers to the emulsions ability to give you a good exposure, and stencil, within specific time interval. Dual cure emulsions have a much wider exposure latitude which means they are forgiving and will make a good stencil at a wider range of exposure times. This means that it will be easier to burn a screen, especially with detail, using a dual cure emulsion. That also means it will work well with inferior films or films that are not dense enough to block all of the exposure source light. Dual cure emulsions will work well with vellums, transparencies and other home made film positives. On the other hand, photopolymer emulsions need very, very dense or opaque film because they have a smaller exposure latitude. With a photopolymer it is important to come as close as possible to the perfect exposure time. If this exposure time is long enough for light to pass through your film and semi cure the emulsion, then you will have trouble getting your stencil to wash out properly. That’s why a completely black film positive is needed to block all of the exposure source light. Therefore if you are working with inferior film positives, you may want to consider using an emulsion with a wider exposure latitude. The last thing to consider is the exposure time itself. Dual cure emulsions may have a wider exposure latitude but they also take longer to expose and cure than photopolymer emulsions. A screen with film that may take 40 seconds with a photopolymer emulsion will take perhaps 3 minutes on the same light table for a dual cure emulsion. This is just a “guestimation” being that I am not actually comparing real results but they are for illustrative purposes. One reason you may want to consider this when buying emulsions is that heat may cure emulsions. If your light source puts off a lot of heat, it may cause problems with a longer exposure time, savvy? Dual Cure Emulsions – wider exposure latitude, more forgiving with incorrect exposure times and poor film positives, only last about 1 month on the shelf, needs to be mixed with sensitizer. Photopolymer Emulsions – smaller exposure latitude, less forgiving with incorrect exposure times and poor film positives, lasts up to 1 year on the shelf, does not need to be mixed with sensitizer. 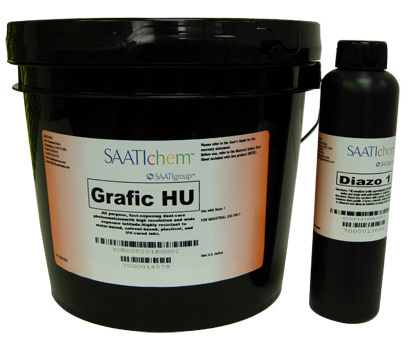 Now you have some technical information about screen printing emulsions that will help you in your screen making process. Please visit the Catspit Productions website to learn all about the screenprinting process. Learn how to screen print with Catspit Productions, LLC! This entry was posted in Screen Printing and tagged screen printing screenprint silk screen heat transfers tee tees shirts t shirt t-shirt how to screen print garments textile supplies equipment tutorial print at home learn to print educational videos. Bookmark the permalink.